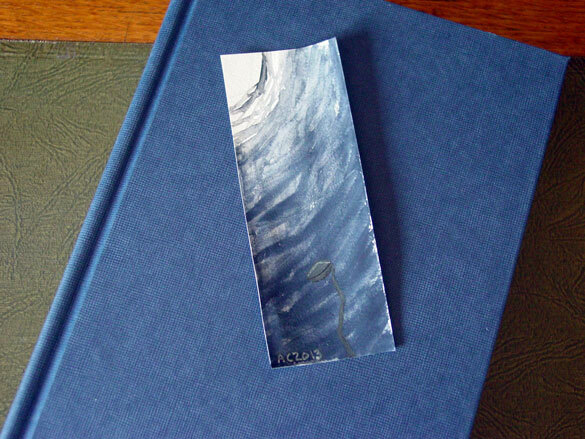 It’s Bookmark Week! This is the time when I take things I’ve doodled onto scraps left over from cutting or tearing paper down to size, and sell them as bookmarks so anyone can have their own wee original bit of Amy art. 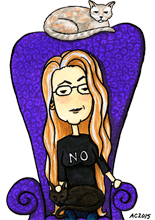 My newsletter people got to see the bookmarks last week, so there’s a few that are already sold, but I’m starting the week with one that you can still take home. This little sprout is struggling up in the moonlight, trying to make the most of its cold light. The paint is matte and darkly colored, but you can pick out the little sprout at the right angle. It’s like a secret! 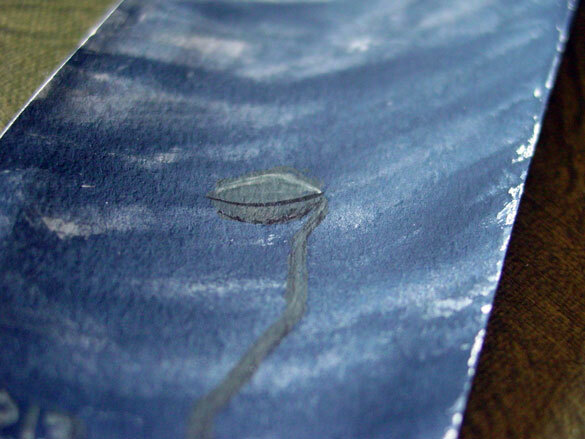 Midnight Sprout bookmark, 2″x5″ watercolor on paper. Above, you can see the way the sunlight illuminates the dark colors, so you can see the deep green and midnight blue, and even the little bits of detail and shadow on the sprout. Below, you can see it hanging out with a nearly-matching hardcover book, so you can get an idea of the size.